This article is a short summary of Super Mario Advance. 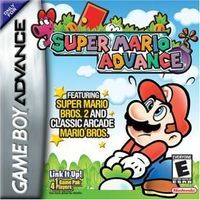 Super Mario Advance is a platformer video game originally released for the Game Boy Advance in 2001. It is an enhanced remake of Super Mario Bros. 2 (USA), with a multiplayer side game of Mario Bros. This page was last edited on 20 January 2016, at 20:48.